Community Action Norfolk has been funded by British Gas Energy Trust’s Healthy Home Fund to support its work on fuel poverty in Norfolk. New legislation comes into effect on Fri 1st April that places a duty on local authorities to create a register of people who have expressed an interest in self-build and custom build projects. 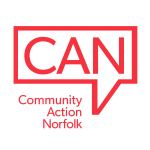 Community Action Norfolk is offering free training seminars to groups on energy related issues that may be relevant to clients, service users, staff or volunteers.